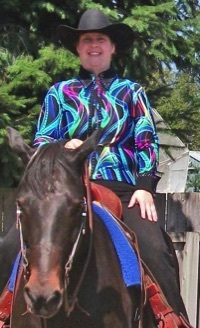 I have been making horse show clothing since my kids started showing in 1985. My, have we come a long way since then. 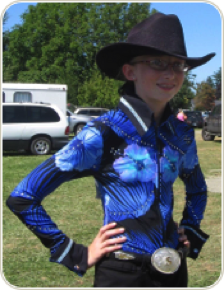 I am still traveling to the APHA shows in the North West and watching for new styles and trends so that my jackets will reflect the latest in the show ring. 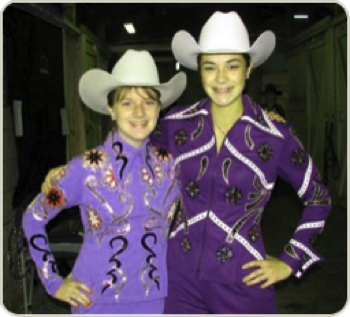 My jackets are made from a variety of medium weight suitings, not spandex. I find that they are comfortable to wear with both stretch and breathability. These materials resist wrinkling and are easily washed. For a more casual look, spandex rail shirts are an economical choice. They are light and comfortable in hot weather and come in an almost unlimited number of colors and patterns from which to choose. Most rail shirts are $150.00. Over the chaps style are $175. 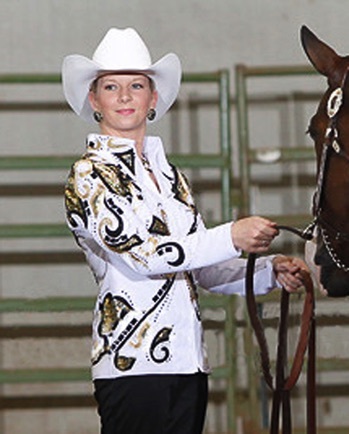 Sample Jacket Designs - These are made in your choice of colors and are made to your measurements, starting at $550. We can also work with your design ideas for an additional $100.